In part 2 of my Cali-Oregon road trip, we drove up the rainy (but gorgeous) Oregon coast, picked up a hitchhiker, headed inland, camped some more, and ended in Portland, where we parted ways. I couchsurfed with some lovely people and explored the city of Portland, but really enjoyed my time hiking and driving with yet another Couchsurfer, Andrew. Hiking up Saddle Mountain was just beautiful, and the coast wasn’t too shabby either! Oregon definitely had the less-explored, raw beauty factor, and the residents couldn’t have been nicer. Food truck pods? Yes, please! 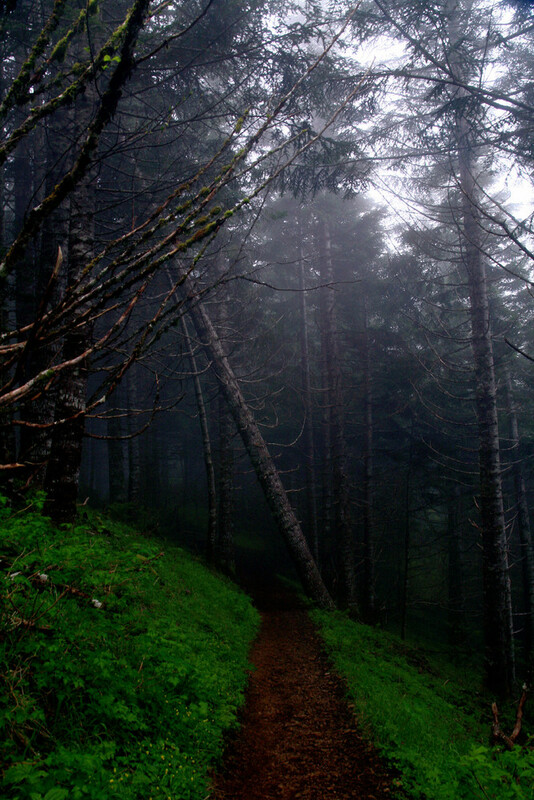 It’s not a place I’m dying to live, but I can’t wait to explore the wilds of Oregon again. (1) Okay, so MAYBE this is why I immediately fell in love with Oregon. Though I was disappointed in Portland itself, the countryside and coast (at least, what I got to see of it) far exceeded my expectations. Too bad it was raining all the time. Still, gorgeous. (2) Welcome to Oregon. Did we mention that we’re awesome? (3) Westernmost lighthouse in the U.S., and just a walk from our campground! I went out for a walk and got caught in a sudden storm. While I love taking photos in black and white and don’t normally convert afterward, I thought this photo looked a lot more awesome in B&W than in dark blue. (4) This moss-lichen-like stuff on the trees completely reminded me of coral in tropical waters. (5) The log-laden coast. And if you think that this place isn’t huge, then take a look at those two white logs sticking up next to the rock. We’re sitting on them in the next photo. (6) A storm was about to roll in…. (10) The wind blew my hat off right after this, and I caught it just before it was swept off a cliff. (11) The hill is off, not you. (13) On the Oregon beach sand dunes doing a jump shot with…our hitchhiker?! Still not sure what kind of stealthy hand signal he’s giving here, but his jump sure failed. (14) Awesome, cobweb-like view as a result of camping in yet another illegal spot. (15) Jumping at the top of Multnomah Falls. That’s Washington State behind us! Didn’t get there, though. 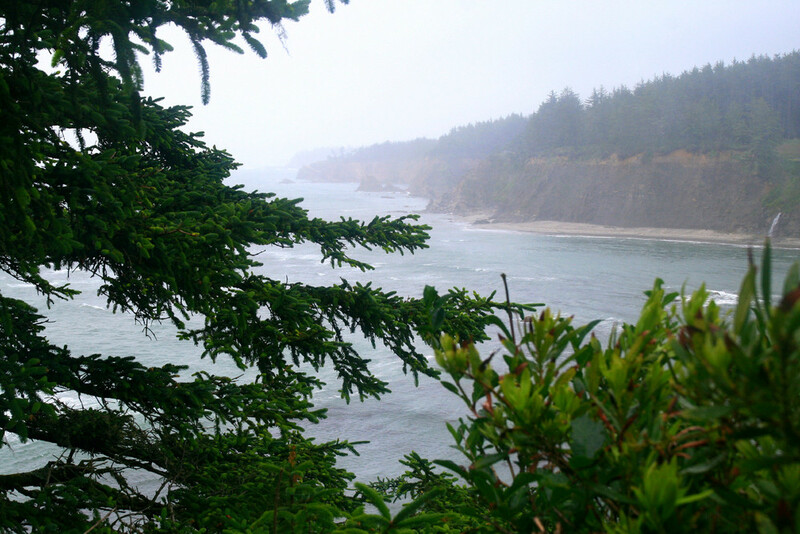 (16) Oregon had patches of amazing temperate rainforests everywhere…and we camped about 15 feet from here. It was just beautiful. (17) Last jump shot, really! It was wet from the spray AND rain. (18) No obnoxious jumpers in the way this time. (19) Mt. Hood over Portland! (20) The Rose Gardens of Portland. (22) Ahhhh the rain is ALMOST worth it when it produces flora like this. (23) The esteemed, unforgettable, one-of-a-kind, honorable knighted Sir Andrew Judkins. (25) Hiking on the mountain. (26) Crazy view! I love the angles. (27) Naturally the fog lifted after we made it to the top, couldn’t see a thing, and then hiked back down. (28) I loved these random veins of different rocks spilling out of the mountain. This one looks like a mini rock Loch Ness, eh? The view of beautiful trees and the unfortunate deforestation was quite stunning. (29) It was an amazing view down. (32) This photo = 100% awesomeness. (33) This is a.) the biggest clover I’ve seen in my life, or b.) Oregon Oxalis. It tastes like a green apple. Unless you eat a lot of it, in which case it tastes like death. (35) …I like it better in B&W. (37) This was the best I could do. I know the angle is wrong, but I hadn’t seen the photo in a while…thanks for telling me about it, though! It was amazing. (38) Canon beach, you are gorgeous. Especially when you’re free because the attendant lets us sneak in. This entry was tagged antitouristtravelinoregon, californiaroadtrip, campinginoregon, canonbeachoregon, drivingfromcaliforniatooregon, hownottobeatouristintheusa, kathryncooperphotography, multnomahfalls, oregonoxalis, roadtriporegon, therosegardenportland. Bookmark the permalink. (All) You’re out this way in OR? What’s a few more hours to come and visit? 🙂 Or, maybe I can come see you! (All) Too late…:-( I came back in June. I wish I had known you were out there! (All) Say, I seem to remember a promise of getting tagged if I accepted your friendship. Are you being a lasagna hog? (All) May a moody baby…doom a yam? You will get tagged…I’ve saved the best for last! (All) Sounds like UFO tofu to me. (All) Matthew, I DID go to Powell’s. Twice! I did not go to Voodoo, though I walked by. Just…decided not to. Next time I guess, if I can avoid the crowds and getting married part. (4) It looks like it’s being assimilated by the Borg! (7) beautiful… I am going to take this one. With you on the credits of course!!! (17) Jump shot? Are you sure it’s not an alley-oop? (17) It’s only an alley-oop if you want it to be. Do you want it to be? (20) Kathryn, that is so gorgeous!!! (23) Dang! What a review! I like this writer! (26) Haha, Kathryn. When I read this tag, in my mind I said "angels," and when I was looking at the picture, I was like, "what is she talking about??" I see no angels.haha….it’s early. (26) All these pictures are fantastic, by the way. What a delightful day! Well, it would be for me anwyay!! Love your beautiful spring/winter images! We’ve been enduring some really heavy rain. Six inches in less that 24 hours! Feels like April showers here!! Glad you had the time to go out and explore in the snow!! (32) Hi! =) Hahaha! I bet guys hit on me all the time because I’m so friendly! (32) 100% straight, my friend. But don’t let the guys see this photo. EVER. 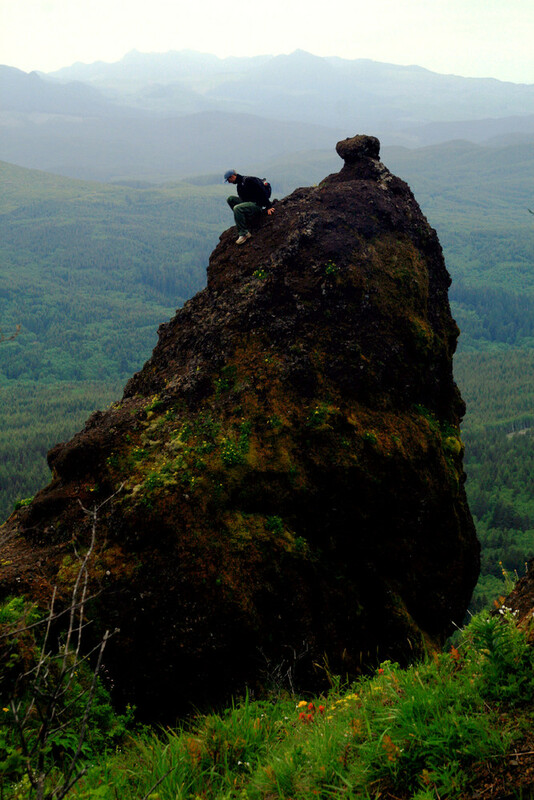 (39) that is an incredible photo – might even beat pinnacle rock…..
(39) Oh HECK NO it doesn’t beat pinnacle rock. This was a cool rock with an amazing view, but pinnacle was a whole challenge in itself just to climb up! This was a cinch compared to that one.